I have now used my new iPad for more than a couple weeks. 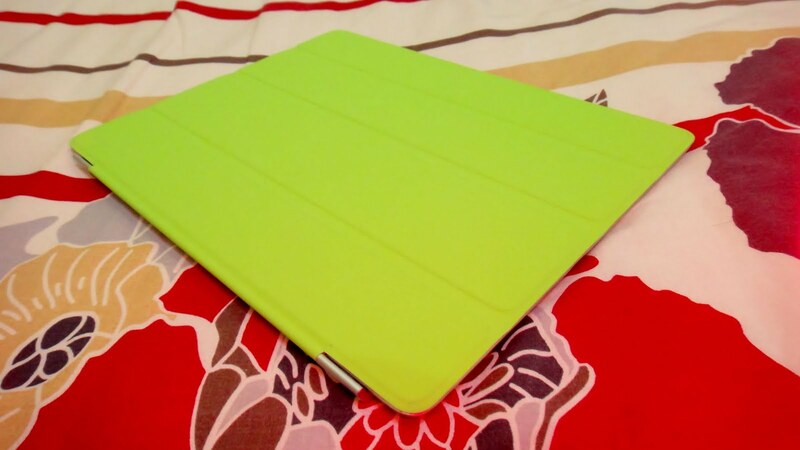 I bought the green polyurethane Smart Cover with it and I thought I'll review it. Read on if you are thinking of purchasing a Smart Cover. You might be doubtful whether you should get the Smart Cover that just covers the front or a third-party case for your iPad that might provide more protection. The Smart Cover is Apple's official cover for the iPad 2. It covers the front of the screen and attaches to magnets hidden inside the (currently) new iPad. The leather version comes for $69 in the US and many other countries, which is a bit overpriced in my opinion. The cheaper, polyurethane version retails for $39. The latter also comes in brighter colors. As you can see in the photos, I got the bright green one. Let's get started with the good and bad. Does not add any bulk: This one was a selling point for me. The iPad 2 is slim. It's thinner than the already sleek iPhone 4. You don't want to hide away its beauty in a thick case, do you? The Smart Cover is light too. Covers the essentials: As Apple says, the Smart Cover protects the LCD from scratches, without adding any bulk and lets the "durable" aluminum back on its own. After all these days of using the iPad with the Smart Cover, I can totally vouch for it. The backing is not prone to scratches. While the LCD is also meant to be scratch resistant, I think it needs a cover. But don't bother at all about a protective film. The iPad was made to be used without it. Adds functionality: The Smart Cover puts your iPad to sleep and wakes it up again. Apart from that, some apps like Evernote Peek (free) and Stockpeek ($0.99) are utilizing this feature of the Smart Cover to provide some extra functionality also. Doubles as two stands: The Smart Cover makes an awesome stand for typing. 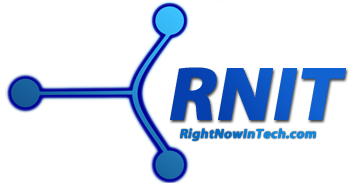 It's not just marketing talk. I cannot say how good the Smart Cover is for typing. Also, you can prop up your iPad to watch video with the Smart Cover. The angle is most perfect if you are sitting in front of a desk, but it's still useful. Easy and convenient: The magnets make taking it off and putting it back on very easy. Although not a feature, when storing the Smart Cover separately, you can fold it in several ways. It will stay that way because of the magnets. Does not scratch the iPad: Apple has made the cover for the iPad. Because it's meant to go with it, it does not scratch your beautiful tablet. It's got protection. Does not clean your screen (but may add dust): Apple says that the cover has a microfiber lining inside, which will clean your screen as you use it. Unfortunately, that's not entirely true. It does have a microfiber cloth (that is used to wipe screens, specs and other stuff), but in my use, I found that it was in itself a dust magnet, which simply deposited the annoying dust to the screen when I put it on. 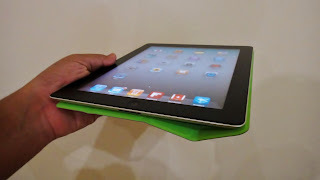 Flaps around when holding the iPad in hands: The cover isn't really as smart as Apple says it is. There are no magnets on the underside of the iPad 2. This makes the Smart Cover flap around when you are holding the device in your hands, unless you awkwardly make the thing stuck to the bottom using the magnets on the front. Leather version may fade: While I don't have a leather version, Apple says that the color might fade over time. I have also seen this on some reviews on the web. Doesn't work in portrait mode: The Smart Cover is only made to work with the landscape orientation. It does not act as a stand when you are using it in portrait. I am actually really happy with my Smart Cover. I still think this is the best cover you can get for your iPad 2, as it does not add any bulk to it and shows off the tablet's beauty. Apart from the dust magnet, none of the negative points mentioned above can be a potential dealbreaker in my opinion. If you do get a Smart Cover, I'll suggest that you don't get the leather versions, as they are really overpriced. But that can be a personal preference. I personally like the bright covers of the plastic version. Do you have anything to add about the cover yourself? Post your views and thoughts in the comments. If I find something worth mentioning, I'll add it to the post with a shout out to you.